This year's Davos forum taking place from January 17, is supposed to be dominated by a haunting specter of hostility to globalization and the rise of protectionism around the world. It comes at a time, when the new U.S. president-elect is talking tough on trade, promising tariffs and increased government interference in the market. The forum will end on the day the new president is sworn in. It also, for the first time, features the Chinese President Xi Jinping. Xi's pitch was fundamentally a focus on free trade rather than geopolitical confrontation, and a pitch for inclusive globalization. Protectionism, nativism and populism were identified as three threats that must be contended with by a more cooperative approach to global trade. The speech itself comprised of a robust defense of the current world order. Political scientist Ian Bremmer commented on twitter that if one closes their eyes one can imagine it was an economist speaking. The Guardian decribed Xi as a defender of globalization. The speech was carefully calibrated to position China as the defender of norms, trade and the global order, as the U.S. likely turns inward. In political science a vacuum is always filled, and that was evident in Davos. The speech was also quite conciliatory towards Europeans but also to Americans, as China seeks to play the role of the mature adult amidst the volatile and looming trade wars. It came as a relief especially to the EU trade block, who is increasingly finding it difficult to face the populist anti-globalization tide across the Atlantic. Xi mentioned, in a quite straightforward way, the rhetoric that one is used to hearing from the EU, that the time for a strict pursuing of national interest is not now, rather one should seek to promote a more multilateral development model. In two remarkable parts, Xi defended climate change efforts as highlighted by the Paris accord. It comes at a direct contrast and role reversal, where U.S. President-elect Trump has hinted in cancelling the deal and taking the U.S. out of it. The second thing that was noteworthy was Xi stating that there is essentially no winner in a trade war. The sentiment was quite popular with European delegations, who find themselves in an increasingly serious situation with Brexit Britain, Trump and a revanchist Russia on all sides. They are in search of a status quo, trade focused global power, which Xi promoted. The contentious issue of China devaluing currency was also mentioned, with the Chinese side maintaining that this won't be pursued as a strategy for a trade war. It is unlikely whether there would be a comprehensive bilateral meeting between the Chinese and the American side, but the channels of communication are vital at this early stage. It is also an increasing turn of events, and possibly the first time in my lifetime that I would observe a protectionist U.S. trade delegation. The reason is multifaceted. Both U.S. parties now support varied forms of protectionist policies when it comes to trade. The British voted out of the EU, even at the cost of losing the free market. Pretty much all nationalist parties in Europe, from Greece to Hungary, support stronger states, active state interference in trade, and the weakening of globalization. One of the reasons is the disconnect between the elites and the masses because the fruits of globalization have not been evenly distributed. Despite free trade being overall beneficial for the majority of the global population since the 1990s, the distance between the top and bottom rung of society has kept in increasing. The humanitarian contributions of globalization are therefore almost always overlooked. The second reason is the relative betterment of life naturally increases expectations about the standard of living. That, and the spread of new media clouded the narrative of how free trade has been beneficial mutually for both Western and Eastern societies and contributed to this idea that free trade has hurt America's standing. Finally, one of the effects of free trade has been the free movement of labor, and nowhere other than Europe and the United States has faced such a burden of integration and assimilation of migrant movement, which has increased the polarization of society. All these factors are highlighted in academic reports, which has led to an increasing skepticism about free trade in the West. Davos therefore provides a fantastic opportunity for China to lay a new vision of inclusive globalization, an idea that is increasingly being considered in the West as well. 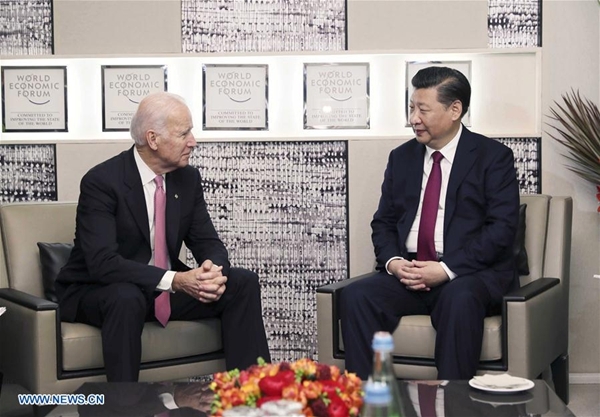 Although the U.S. side was represented by Vice President Biden, the Chinese team was prudent to focus and measure the incoming administration and find grounds of commonalities including the core areas of interest where China and the United States can start a transactional dialogue. To quote the words of Huang Jing, professor of the National University of Singapore, China is now acting as the defender of the pro-trade global order that arguably was created by the U.S. Ultimately countries that are open to free trade will be benefitted in the long-term and smaller countries will follow them. This should be the message of Davos.